This course will prepare you to successfully utilize design as a catalyst for innovation and change. Along the way, you will investigate the world of innovation, creativity and design thinking. In this class you will venture into the world of “fuzzy” or unstructured situations where problems are yet undefined but within a larger context. You will use design research methods to sort through and tackle complex conditions— where you must identify and define those unstated needs for design—possibly utilizing design that goes outside the classic concerns of traditional visual communication. Application and integration of theory, methods and skills for design analysis in the context of cross-disciplinary collaborative processes for innovation. Identifying patterns and framing insights. Emphasis on defining problems in fuzzy situations. Surveying, performing and evaluating design analysis methodologies from multiple disciplinary perspectives. Several techniques will be explored within each phase of the design research process. understand the theory, practice and outcomes of various design-led innovation methods. determine appropriate methods to gather useful data for the task at-hand. synthesize and present process, finding, and reflection about practiced methods in a meaningful way. develop a research plan to drive innovation in a defined area. demonstrate an ability to work collaboratively and facilitate participatory activities. visually communicate process, outcomes and insights through infogrpahics and/or data visualizations. collaborate with others and show respect for their differences. express civic identity and how service integrates into his or her larger identity. discuss the benefit that design activities bring to the act of civic engagement. visualization of gathered data and solutions and the creation of prototypes for evaluation. extracting maximum information from facts. using strategies to break down problems into manageable parts. identifying likely causes of problems. recognizing the patterns that are present within given situations. looking at a decision from all points of view. selecting the most important changes to make. weighing pros and cons of a decision and by projecting likely outcomes. Visual Communication 5: Design for Innovation will provide a thorough investigation of the design and design research processes. 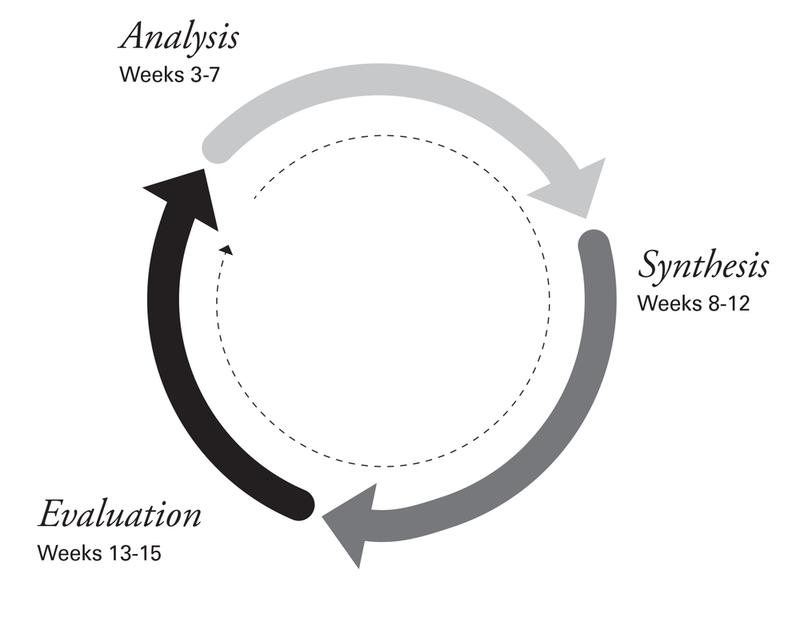 Emphasis will be placed on the use of methods at each stage of the process: Analysis, Synthesis, Evaluation. The semester will be segmented according to these processes phases. Each section of the semester will ask you to focus on selecting appropriate methods for the task at hand, think about the role of the designer in that phase, and formulate visuals that accurately portray the collected data or insights from that phase. Students taking part in a visualization workshop.